Say Hello to our stunning Love Lace Luxe invitation! Beautifully understated, the mint colour palette makes this the perfect choice for a wedding in any season. Maybe you’re looking to organise a winter wonderland? In which case, why not take inspiration from the clean fresh look that this invitation boasts, reminiscent of crisp winter mornings? Perhaps a summer wedding by the sea is on the cards and the colour scheme fits in with your vision of blue skies and shimmery waters? 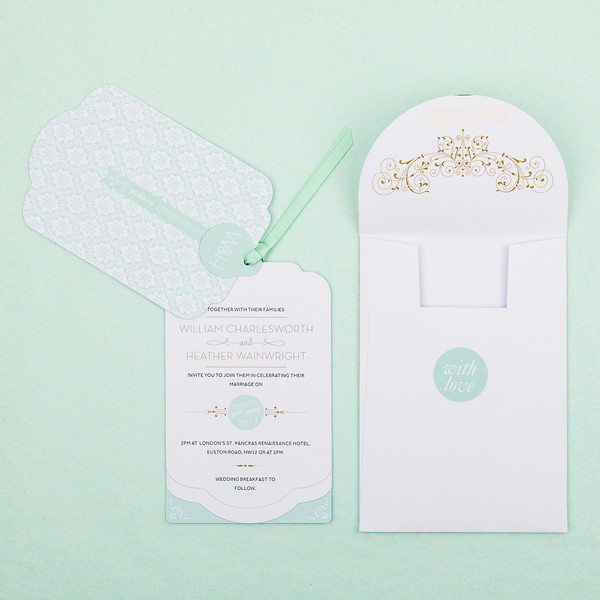 Whatever your wedding dream, the Love Lace Luxe invitation from Eagle Eyed Brides provides a versatile look that will fit in with any venue or theme. The sophisticated and timeless look has been inspired by one of the oldest buildings in London, the 5* St Pancras Renaissance Hotel. In fact, what you see is an original pattern taken from this magnificent Victorian building; the classic gold pattern is in homage to the hotel’s gold leaf ceilings and its grand staircase – a pretty awesome fact to tell your guests! The cunning 14.5cm x 9cm tag-style format of this invitation means that as well as a day or evening page, you can have an information page and an RSVP page added to keep everything organised and in one place (you can choose between 2 or 3 pages) – all secured elegantly with premium ribbon. With little details such as a personalised monogram, ‘With Love’ sticker and striking typefaces, this is certainly a wedding invitation that will impress everyone on your guest list! Tags: Classic, Luggage Tags, Mint Green, Sophisticated.